On the night of January 7, undercover cops pulled up in an unmarked SUV without identifying themselves as police, cornered Hor in an alley and shot him after he allegedly “pulled out a gun.” Police claim that they were looking for him in connection to an alleged burglary and weapons violation charges. But Hor was unarmed and had committed no crime. Since the shooting, police reports and media coverage have launched a smear campaign against Hor, releasing contradictory information and branding him in typical racist fashion as a gang member, a euphemism for being brown in a poor neighborhood. 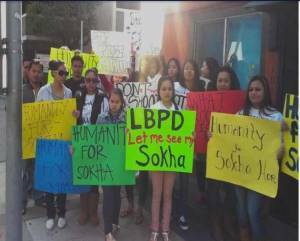 Family and friends of Sokha Hor rallied outside the hospital to demand humanetreatment of their loved one. Protesters carried signs that read “Let us see our brother,” and “Humanity for Sokha.” Onlookers and cars passing by expressed their sympathy for the family and honked in support. Even with the full support of his family and the community, police personnel continued to deny the family their right to see Hor. The movement quickly spread throughout the Long Beach community and a broad network of police brutality activists in Southern California, all of whom bombarded the city government and police department with of phone calls and emails, demanding visitation rights for the family. The public outcry forced LBPD to create an arbitrary set of guidelines to permit family visits. Hor can be visited by only two people per week for a 30-minute period under police supervision and those two individuals can not have been previously arrested. It appears that LBPD invented these rules and could easily grant full visitation rights but are afraid that Hor will regain his strength and tell the truth of what happened that night. 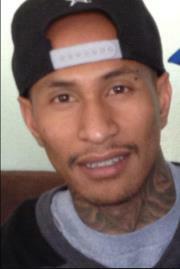 Incidents of racial profiling and police brutality are common in Long Beach. In the first weeks of 2013 there have already been two police involved shootings in the city. While Sokha Hor remains in critical condition, one of his sisters expressed the family's intention to continue the struggle with more protest actions, including a demonstration on January 20, organized in coordination with the ANSWER Coalition and Long Beach Campaign to Stop Police Violence.